Made in under 1 week with a team of 5. 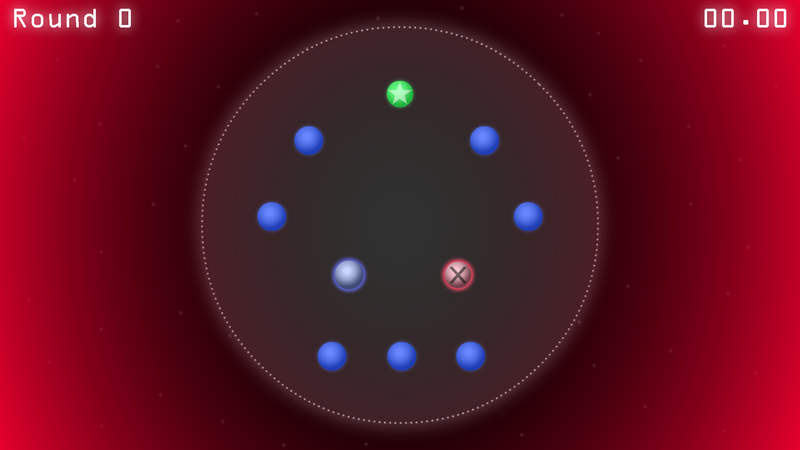 “Lightning Round” is a cooperative game for 2 players (plus one wire-manager, optional based on wiring setup). What was originally conceived as a physical obstacle course evolved into a crazy, fast-paced, objective based arena game. The players must maintain physical contact with both each other and the course at all times. They must then maneuver themselves to reach as many of the indicated goal points as possible within the time limit while avoiding points marked as hazards. If they fail to maintain contact or touch one of these hazards, they will receive a time penalty. The goal of this project was to create the most fun game possible in an extremely short amount of time. To achieve this, we leveraged the power of high-speed, physical, unconventional co-op gameplay. A quick visual prototype built in Flash helped provide the team with a greater understanding of how the game would work with our final version of the mechanics. The prototype also helped us to figure out how we would indicate the current state of the physical arena. 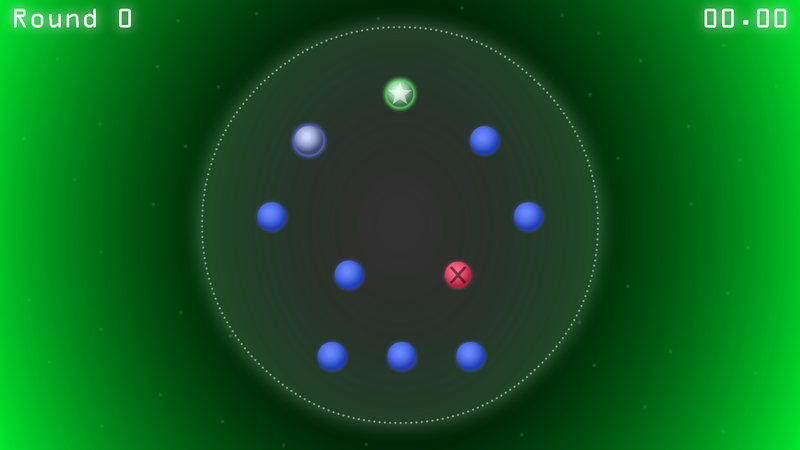 A glowing effect on an individual point means it is being touched by a player, while a glow border on the entire screen would mean either a penalty or a goal point has been reached. Ultimately, the team decided to keep the visual style of this prototype with a just a few enhancing effects. The visual assets were exported for use in the final Unity build. Conductive helmets on the players enabled their bodies to become a part of the circuits that detect all aspects of gameplay. Ideally, the circuitry for this game would be made wireless to avoid physically interfering with the players. This was not possible given our time constraints. Our solution was to use a large fishing-pole style setup to enable a “wire-manager” to hold the wires connected to the players above their heads and well out of the way. We performed several test runs to iterate on our arena layout and find the best arrangement of “grapple points” to give our game the right level of physical challenge. As you can see here, we have an array of “grapple points” for you. More commonly known as “sponges on chairs.” These points are mirrored on the display above. 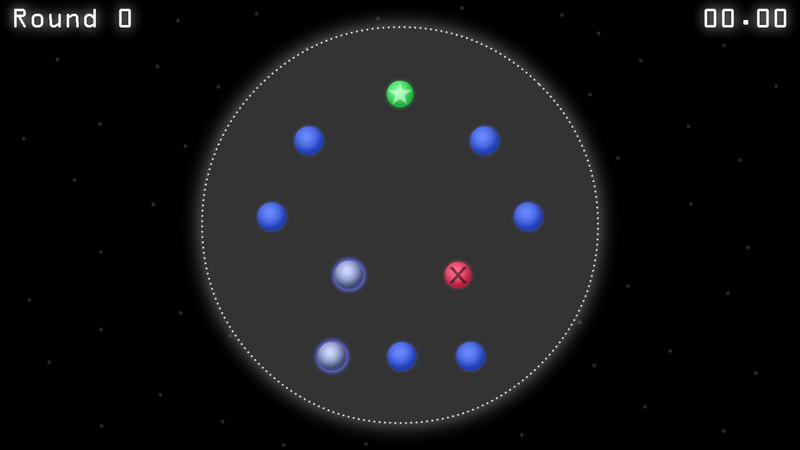 Now, when the game begins, one of those points will turn GREEN. This is now your “goal point.” You increase your score by grabbing the goal point. Once you do, a new goal point will appear, and so on and so on. Your objective is to work together to increase your score by grabbing as many goal points as you can in 2 minutes! WELL, IT’S NOT! This is Lightning Round! The rules of this course are going to try and make you lose that precious time as quickly as possible! Rule #1! – You two are now partners. This means you must stay linked. If you maintain contact with your partner, you should be just fine. However, if the link is broken, the timer will start to count down FASTER until you join back up. Rule #2! – As a team, you must maintain contact with at least one grapple point. If neither of you is holding a point, the timer will count down FASTER until you grab another point. If you are holding one point and your partner grabs another, it is safe for you to let go. So, the best way to move through the course is to spread yourselves out and move from one point to another. Rule #3! – As the game goes on, some of the points on the display will turn RED. These points are HAZARDS! BAD points! If you grab a bad point, the time will count down FASTER until you let go of it. So keep an eye on that display so you aren’t caught off guard! FINAL RULE! – Don’t move the chairs. Seriously. Please. Now, grab your first starting point. GREAT! Let’s play… LIGHTNING ROUND!